It's summertime, and that means we are friendless in Paris. Or that's almost true: our girls have, literally, no Parisian friends in Paris, though they do occasionally have an American friend passing through as a tourist. If it seems like the girls and I, in particular, travel a lot in the summer, that's largely the reason. As soon as school is over -- and I'm talking about the Friday night after school lets out for the year at 4:30pm or the next morning -- the vast majority of their friends leave for the summer. For the entire summer. Some are gone with one or both (less commonly) parents to their country homes; those with parents who need to stay in Paris for the summer for their jobs generally go to their grandparents' country homes. I realize it sounds like I'm exaggerating, but I'm not. By coincidence, on our trip back from the Vendée and just before we head out to Alsace (more on that to come), one of Pippa's friends was just home from the Jura in eastern France for two days before heading out to stay with her grandparents in Bulgaria. The fact that Pippa got to play with a school friend in the middle of summer is near miraculous. That's one playdate for both of our daughters in three summers here. And this is not particular to our school or group of friends. Obviously, and realistically, there must be a socio-economic class that stays in Paris during the summer. But here it's not just the very rich that leave the city, but also all levels of the middle class, largely because train travel is so cheap and easy, and homes in the country are not necessarily dearly purchased second homes but sometimes rather old, inherited (or shared) family homes. We come in and out of Paris all summer as we go to various friends' houses and vacations, sometimes with Anthony, and sometimes just myself and the girls. This year, in particular, we've taken a lot of really big trips since January and, as Anthony says, "Even on a French schedule, there's a limit to how much vacation time a person can take." So, he's working much of the summer in Paris, and on weekends, either we're coming back between trips to see him (Paris is the train hub for everywhere, anyway), or he's joining us outside of the city. But whichever way it works out for our travels, one things for sure: When we're here in Paris in the summertime, our French friends are not. 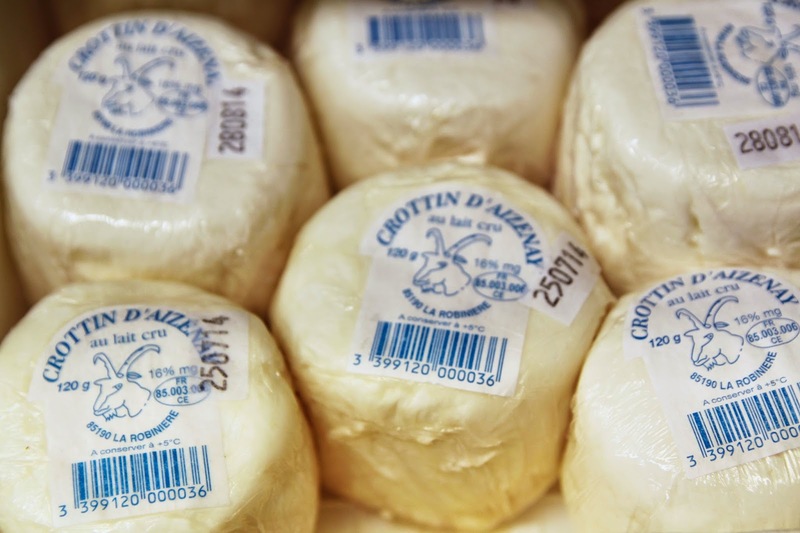 Crottin d'Aizenay is a fresh, raw goat's milk cheese made only at one farm in Aizenay, in the Vendée. It's only sold at the farm and at nearby shops, for that matter, largely because it's just so soft and fresh, it wouldn't transport well. Mister Zerathe specializes in artisanal goat cheeses, and this particular one comes in two varieties: plain or ashed. It's soft, fresh, and mousse-like. The flavor is very mild, but it's cool and refreshing, and seems like a perfect hot-weather, beach-side cheese. And I certainly wouldn't complain about the addition of a little drizzle of honey or jam on it. Like our Parisian friends in the summertime, Crottin d'Aizenay cannot be found in Paris; instead, I find it in the countryside -- in this case the Vendée, by the ocean.